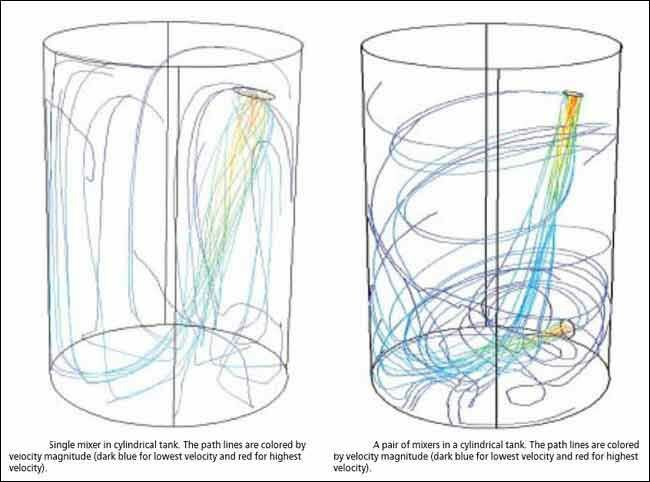 Computational Fluid Dynamics (CFD) modeling software has gained lot of prominence in the last decades. The major reason for that being availability of increasing computer power. One aspect of CFD is the fact that great colorful pictures can be obtained with the help of CFD that can be used to get useful insights to flow phenomena and the ease with which CFD has been illustrated has gained lot of prominence in the industries as we speak right now. Even those who were quite skeptical about the application of CFD software have appreciated the software. One of the basic advantages of this software can be assessed from its ability to predict flow patterns in both simple and complex geometries. The output that is received from these models, when analyzed by a CFD engineers experienced in the field of fluid mixing, is an important tool in industrial mixing design. But it is highly essential to have proper apprehension about fundamental fluid mechanics for getting proper results through CFD. Thus; it becomes highly critical to have experienced engineers for handling CFD software so that they can easily comprehend with the latest analysis tools and are well versed in mixing technology. Now mixers can be modeled using 2D or 3D CFD techniques. If you are using 2D CFD technique then it is applied to only to axi-symmetric installations i.e., round tanks that are fully baffled, with a mixer mounted vertically on the center. Knowledge of the impeller outlet velocity profile is required for 2D modeling, which is obtained through experimental techniques such as laser Doppler velocimetry (LDV). It is very important to note that while 2D modeling gives quick approximation of the mixing tank flow pattern in the vertical plane, it supports rapid decisions on impeller placement and number of impellers required. While in the case of 3D modeling impeller geometry and its rotation are taken into account. But you can always go ahead and validate the flow field predicted through 3D CFD using LDV results. It is possible to have multiple varieties of mixer geometries or multiple mixers within a tank to be modeled. If you compare 2D CFD with 3D you will come to the conclusion that 3D CFD is more helpful for comparing initial mixer design options and process troubleshooting. On top of it; 3D CFD can help you regulate the flow-pattern effect of both inlet and outlet flows entering a tank. With the help of this analysis, it is possible to conclude whether an inlet stream will short circuit or have a negative impact on the mixer-established flow pattern. But there are some limitations when we try to establish the influence of CFD on application of mixer design. With the help of an experienced CFD engineer; it is likely to predict process variables like blend time or cloud height for solids suspension applications. It is also probable to predict gas distribution in gas-liquid dispersion applications but the time required to run the models increases significantly using CFD because of the complexity of the models required. There is a need for multiple computers to be operated for days rather than hours to get the requisite solution. CFD is highly useful in assessment of mixer design and application but it cannot be used as a standalone design tool. This is one of the biggest limitations. But mixer design not only includes enhancing the impeller design but also comprises of mechanical design, tank structural design, and tank internals design among others. But if CFD is applied correctly it can be used effectively to optimize mixer process design.